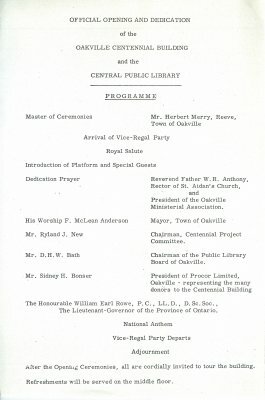 The Programme from the official opening and dedication of the Oakville Centennial building and the Central Public Library. Merry, Herbert, Reeve ; Anthony, W.R. ; Anderson, McLean ; New, Ryland J. ; Bath, Donald ; Bonser, Sidney H. ; Rowe, William E.
Dedication Prayer Reverend Father W. R. Anthony, Rector of St. Aidan's Church, and President of the Oakville Ministerial Association. Mr. Ryland J. New Chairman, Centennial Project Committee. Mr. D.H. W. Bath Chairman of the Public Library Board of Oakville. The Lieutenant-Governor of the Province of Ontario. After the Opening Ceremonies, all are cordially invited to tour the building. Refreshments will be served on the middle floor.